Blurb Description: In the domed city of Evanescence, appearance is everything. A Natural Born amongst genetically-altered Aristocrats, all Ella ever wanted was to be like everyone else. Augmented, sparkling, and perfect. Then…the crash. Devastated by her father’s death and struggling with her new physical limitations, Ella is terrified to learn she is not just alone, but little more than a prisoner. The world as we know today is gone. Humans with imperfections are a thing of the past. Machines that needed human help to function have been coded out of existence. And the best and brightest of humanity have been chosen to live in Domes - to safeguard their existence, and to protect them from the Disfavoured. The Aristocrats are the definition of perfection. Hair, eyes, body shape, and even their voices and laughs can be Modified and Altered. Babies can be Customized, making them perfect from the minute they're born, clothes are made of the finest materials, parties are only ever thrown in the grandest manner, and citizens are kept in line through their G-Chips. The thing with humans, though, is that we are never happy with what we have. And the Aristocrats? Nothing they do is for love, but more for standing in society. And then Warren Drexel creates Nexis. A virtual reality game of the world we lost, designed to give everyone anything they desire. Nexis is the new IT thing - what all Aristocrats must have; what they must succeed at. Exempt for the creator's daughter, Ellani Drexel, who resents the game because her father loves it more than her. Until her father dies in a freak accident, and the last thing Natural Ellani told him was that she hated him, and all that's her of the last of her family is a game she thought she would never get into. In Nexis, Ellani finds herself living a more real life than the one she was living back in the Real World. With Nadine, Morden, Opus and Gus, the Tricksters, Ellani finds herself on a quest to enter the mysterious Anansi Chamber, and falling in love with a boy she can't ever have, all while her state appointed guardian is faking her death, denying her prosthetic legs and keeping her under lock and key - a futuristic Cinderella. A little into reading Nexis, I though that this book would be one I hated, or this series would be one that I didn't particularly want to follow through until the end, but Nexis and A.L.Davroe proved me wrong on all counts - Nexis was a BRILLIANT book, be it the writing, execution, storyline, twists, characters and even the love story- it was absolutely mind blowing, and I can't wait to recommend it to everyone I know. I don't know why I loved it, I just did. And by loved it , I mean I LOVED LOVED LOVED LOVED LOVED LOVED it, so much so that I finished it in one sitting in lieu of studying for an exam that was just the next day- and I didn't event feel guilty about it! I can't explain why I loved it, but I did. 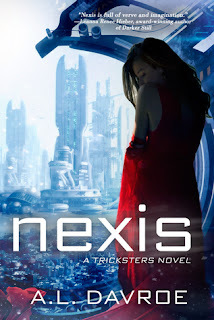 Even if you think gaming books are not for you, or that the description sounds way too sci-fi for you, or too out there - Nexis isn't actually like that. It's written for all YA readers, and whoever you are, I assure you that you will have the time of your life reading this masterpiece. I have just one question: WHEN IS BOOK TWO COMING?! And is there a paperback I can get my hands on? What a lovely review! I'm so glad you liked this book Aditi. I'm sorry to take away from studying, I hope you still did well on your test! Well I'm so glad I found this book and already added it to my TBR list on Goodreads! It sounds fantastic and I'm so excited to read it. Great review.